Consulting firm AlixPartners has built a strong investigations team worldwide that was recently retained by a European telecommunications company to assist it following a Foreign Corrupt Practices Act investigation. AlixPartners conducts large-scale corporate investigations and monitorships across the globe with a team of accountants, fraud examiners, anti-money laundering specialists, and a host of former Securities and Exchange Commission officials. The firm was founded in 1981 and has been racking up multinational clients over the past few decades. The firm has a number of professionals with government experience including Susan Markel, Brad Mroski and Matt Jacques who have all had senior roles at the SEC. The three are based in Washington DC, Dallas and Boston respectively. New York managing director Sven Stumbauer was a compliance examiner at the Financial Industry Regulatory Authority Corporation (FINRA), and now helps financial institutions with anti-money laundering and sanctions matters. In the UK, Kelly Greener has been an investigator at the Serious Fraud Office and the Financial Conduct Authority. Other names to know are Charles Laurence in New York who has brought a range of investigative reviews to the SEC and US Department of Justice. Laurence has led numerous FCPA probes; conducted compliance reviews in Europe and the Middle East; and assisted major Japanese, Chinese and US banks in anti-money laundering and sanctions investigations. Kathryn Britten, Andrew Grantham and Diane Hughes, based in London, lead the team for Europe, the Middle East and Africa. Britten has 25 years of experience in forensic investigations where she has covered a variety of industries including pharmaceuticals, construction and natural resources. Grantham has decades of experience in financial and accounting investigations and has acted as an expert accounting witness. He was appointed as an inspector by the UK Department of Trade and Industry to investigate accounting irregularities. Hughes has also been appointed as an expert witness many times in commercial disputes and following forensic investigations. She most recently investigated several collapsed banks in Eastern Europe. The practice in Asia is led by Colum Bancroft, based in Hong Kong, who recently joined the firm from Kroll. With three decades of experience investigating Foreign Corrupt Practices Act, anti-money laundering and US sanctions violations, Bancroft is supported by Stephen Yu in Shanghai. Yu leads AlixPartners’ e-discovery efforts, and has gained significant experience helping Chinese state-owned enterprises resolve legal issues in foreign jurisdictions. In Tokyo, John Natividad was previously at KPMG in Los Angeles, and helps multinational companies on matters all over the world. In Germany, Veit Buetterlin and Günter Degitz have worked on investigations related to Europe’s biggest financial crime cases. Buetterlin, based in Munich, has advised multinational companies over compliance monitorships following US enforcement actions. Degitz manages investigations involving misconduct of top management and government officials. In March, former AlixPartners director Jenna Voss in New York left the firm to join Forensic Risk Alliance. She was previously director of financial advisory services. The firm was able to divulge that it was retained to analyse the potential disgorgement to be paid to US authorities as part of a Foreign Corrupt Practices Act settlement for a European telecommunications company. AlixPartners is assisting administrators of the International Banking Corporation in Bahrain on a forensic investigation into major financial irregularities the bank identified. The firm reviewed the financial history of the bank including individual loans, forex transactions and investments. It is also helping a UK high street retailer investigate multiple instances of fraudulent accounting. AlixPartners has conducted interviews, reviewed auditing papers and estimated the restatement. The firm has 25 offices spanning four continents. Its investigations, disputes and risk practice stands at 375 professionals in New York, Washington DC, Chicago, Dallas, Boston, London, Munich, Zurich, Düsseldorf, Munich, Hong Kong, Shanghai, Seoul and Tokyo. The firm’s presence began in the US before it expanded to Europe in 2005 and Asia in 2010. AlixPartners wasn’t able to name many of its clients for confidentiality reasons, but it was able to describe some of the matters it has been retained on. It frequently assists law firms and has listed clients including the International Banking Corporation in Bahrain. The firm was instructed by a multinational oil and gas company to investigate its accounting for long-term construction projects. The matter is currently under review by the SEC. The company produced restatements and over five years of financial records just eight months after detecting issues. The investigation was carried out in the United Arab Emirates, Italy and the US. AlixPartners was retained by a technology investment firm into allegations of conflicts of interest and self-dealing that were raised by a whistleblower. The issues were resolved internally. AlixPartners also came to the aid of a US manufacturing company to investigate allegations that certain companies it partnered with were overcharging for services. AlixPartners conducted on-site interviews of the individuals who allegedly defrauded clients. The investigation was the basis for a settlement between the manufacturing client and the companies at issue. AlixPartners is a results-driven global consulting firm that specialises in helping businesses successfully address their most complex and critical challenges. Our clients include companies, corporate boards, law firms, investment banks, private equity firms and others. Founded in 1981, AlixPartners is headquartered in New York, and has offices in more than 20 cities in the US, Europe and Asia. It’s not what we do that makes a difference, it’s how we do it. Tackling situations when time is of the essence is part of our DNA - so we adopt an action-oriented approach at all times. We work in small, highly qualified teams with specific industry and functional expertise, and we hit the ground running. Because our people are assured problem-solvers, our distinctive breadth and depth of experience means we’ve dealt with most situations before and we move quickly from analysis to action. We stand shoulder to shoulder with our clients until the job is done, and only measure our success in terms of the results we deliver. 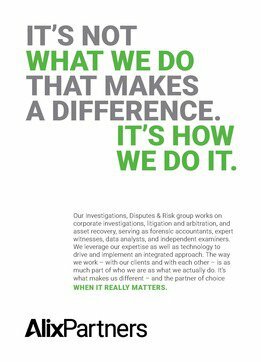 Our investigations, disputes and risk practice advises clients on matters regarding forensic accounting, expert services, litigation and arbitration, and e-discovery and data analytics. Our group of over 350 professionals includes accountants, economists, former regulators, data analytics and legal technology experts who regularly consult on regulatory, financial and digital investigations and disputes, forensic accounting, and asset recovery, and we are often appointed as a monitor or independent examiner. We leverage state-of-the-art technology to drive our investigations, guide clients through their challenges, and implement our integrated approach across offices. The way we work - with our clients, as well as with each other - is as much a part of who we are as what we actually do. It's what makes us different - and the partner of choice for some of the world’s most successful, as well as challenged companies. When it really matters.